Sadly no post here until now so I start a little late for the new version. Yes, the anti structure units. In the games I have tried so far, they are immensely over powered. A few of them wipe out a systems defenses normally pretty quickly, but now they do the same thing to capital ships and titans. And just just one at a time. They wipe out groups of capital ships from range. Yes they are fragile, but they were consistently killing targets before they could get into range to shoot back. The AI if fond of bringing a dozen of them at once or more. They aren't limited in the way capital ships are. 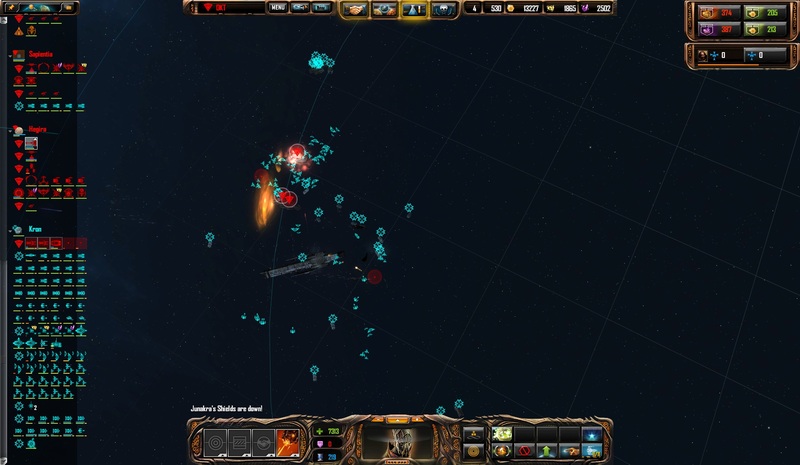 The other ships engage only a couple targets at a time at most (depending on facing). These are hitting multiple capital ships with apparently equal effectiveness. I couldn't hardly get a capital ship to level 3 or 4 with the way it's setup and the AI wasn't doing any better. I don't recall seeing a single capital ship that was over level 4. I can only guess the anti structure ships were wiping them all out before they could get further. I didn't even realize they could hit the smaller ships too. I used to really like this mod till this single specific change killed it for me. It would have been nice if this was a mini-mod instead of a suddenly "on no matter what" item. Could you post a save or screenshot showing this? I haven't had the same experience myself, though maybe if you're playing on the hardest level AIs they might be able to spam these in such numbers to cause this. I usually play capital ships only on hard or very hard and did not yet run into the described problems. It was much fun playing Sins again, but in my personal opinion the game ran worse than my last game. It has/had hickups every now and then. Could be the new W10 Insider though, looks like big changes for Game Mode. I'll see what I can come up with for screen shots. That said; this is the setup. Maybe you can see for yourself. Game setup: Vast map, Vasari with other Vasari as ally on team 1 (Basically Vasari vs All). Maxed out other enemies that are evenly split between that factions. Player types set on random. Normal speeds. Set on hard or unfair for all AI players. Primarily use capital ships with anti-fighter support at first while the planets get built up. More balanced fleets show up in the later part of the game when they can be afforded. The main offender that i've seen do what I describe are the Advent plasma stars (I forget the name). The TEC torpedo ones don't seem to be as bad or aren't hitting 3-4 targets at once. The AI in my game quite frequently shows up with 6-12 (on average; frequently more) of the stars and wrecks the whole system almost before I can move to the system. Thats fairly normal. Irritating, but normal. What isn't normal is now it's doing much the same thing to groups of capital ships. This is compounded if there is a fleet along with the bombardment ships as they have quite a enhanced effect on each other. Now; your right that they are a bit fragile. But their range is such that they are hitting targets from hallway across the planet system and the capital ships are not exactly the fastest units around to close range on them. If there is a fleet rather than just a raiding group (AI seems fond of blocks of these to raid planets solo), this is compounded since to get to the bombardment ships means taking a beating the whole way to them while still under bombardment. Worth mentioning; oddly enough I seem to mostly end up fighting Advent the majority of the time. Bit odd for random placement, but the TEC usually is occupied elsewhere. Those minimods could be making a difference. We cannot guarantee a balanced gameplay experience if you use minimods. We typically only fix truly game breaking exploits (invincible units, free planet upgrades etc) with them. Expanded Research means the Advent will theoretically get +60% damage bonus and +60% rate of fire on Plasma weapons, including those used by the Solanus Adjudicator (AKA Plasma Stars). This gives them one of the largest damage boosts of any weapon type. Max starbase upgrades and more tactical slots suggests you could be a very defensive player. If you have a lot of planetary defenses, the AI maybe reacting to that by building more antistructure cruisers than normal, which is quite reasonable. Solanus Adjucators do deal a lot of total DPS, but they can only focus 1/3 of their firepower on a single target. 2 more targets will be hit, but the exact one cannot be controlled. It may prefer to target capitalships in open battles though because the antimodule plasma weapons only do more damage to titans and space stations. I am thinking of reducing the antimodule damage against some key targets, but regardless the best counter for this is to have a force of faster light frigates or corvettes that can quickly close the range and destroy these ships. Light frigates deal the most damage of any unit to antimodule cruisers while Corvettes are also pretty good, take less damage in return, and are even faster. Ideally I would like to have antimodule cruisers essentially serve as a long range artillery unit/siege engine. Their barrages can devastate large, slow targets (mainly titans and defenses), but are extremely vulnerable to agile smaller ships that can quickly dispose of them. I don't claim that the current balance values are currently creating that, but I like to think it's a step in the right direction that will make these ships a useful but not invincible tool for any commander. Just lost 6+ capital ships inside a minute to what would have normally been an easy fight. That is after blowing up quite a few of them. Simply doesn't work. They take awhile to kill, even for a dozen or more capital ships and in the time that took, the swarm of them kill the rest before they can even retreat. I did enjoy this mod before this change but after going through this frustrating again with the bombardment swarm, I'm giving up on the mod. Good luck. If it helps, if you open the Gameplay.constants file and change these lines to the ones below, antistructure cruisers will basically deal no damage to anything except structures. 1.841, Pirate Captain causing crash. Can sometimes be avoided by scuttling him. It's a problem with Rebellion 1.93. It tried to be backwards compatible but a few things are still broken. For the best experience I recommend reverting to Rebellion 1.92 via the steam betas tab if you can. There will be a new version of the mod when Rebellion 1.94 comes out.
. . . so you're not even bothering to fix it for the current patch when there's no ETA on the next one. With the beta out I'm sure it will be soonish. And it's not that simple. I have not updated because 1.93 broke some features of the mod beyond what us modders could do to fix them. Rather than remove content for a few months, I would rather tell people to revert to 1.92 for now and wait until 1.94 to release the update for minor factions. Enhanced 4X Mod version 1.85 released. Everything seems to be working great on my end. I am also using a handful of your Mod Mods with it.